Yesterday was the last day of the National Pastors Convention. It was a much needed break for me and now here I am back to all my real life problems feeling a bit more ready to face them. The last seminar I was able to attend was one of the most stimulating and challenging. I've got a lot going on in my head right now because of it. It was called "Our Nomadic Life: Undoing the Incarnation Using Nothing But Your Cell Phone" with Shane Hipps, author of Flickering Pixels. Shane, an ex-marketing guru for the Porsche company, spent much of his life convincing us that we all want a Porsche, a simple job you might say but that's the genius of it all. He shared with us how introducing different technological mediums automatically changes the values of a culture regardless of the content. For example, before the book community was vital for the sharing of ideas. If I had an idea, the only way for that idea to come alive was for me to share it with my community otherwise the idea would get lost. Introduce the invention of literacy and writing into such a tribal community and you automatically introduce the value of individualism because now I need to get away from distraction and write down my ideas and fix them in time. Now, you can know my ideas without ever meeting me and I am no longer defendant on my community. If the invention of writing created such a violent shift, now consider the utter hysteria and complexity of introducing things like radio, television, cell phones and the internet. The result of such violent shifts creates a connectivity network which operates on one level out of dozens (if not thousands) of levels of human connectivity and interaction. Now, actually walking up to someone's front door and knocking is non-efficient and ultimately pointless. We, a s Shane eloquently put it, "spoil our appetites" for real connection and physical interaction because we're constantly operating on that one level of community. It turns us into nomads. 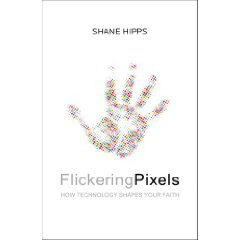 Read Flickering Pixels, How Technology shapes your Faith by Shane Hipps.